Planet Earth II is coming to 4K Ultra HD Blu-ray | What Hi-Fi? The landmark nature documentary is being released on 4K Ultra HD Blu-ray in March, thanks to collaboration between the BBC and Sony. An experimental trial by the BBC just before Christmas meant that owners of select Panasonic TVs could view a four-minute clip of Planet Earth II in 4K on BBC iPlayer, but thanks to its imminent Ultra HD Blu-ray release, it will soon be possible to relive the racer snake and baby iguana chase in its full 4K and high dynamic range (HDR) glory. 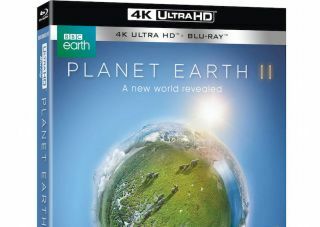 The original Planet Earth was among the first TV series to take advantage of the standard Blu-ray (and HD DVD) format in 2007, so it's fitting that the sequel series will be the first natural history television series released on Ultra HD Blu-ray. According to Lesley Johnson, operation director UK for BBC Worldwide, when filming began four years ago the BBC knew the broadcast date would tie into the 10th anniversary of Planet Earth and always intended to mark the occasion by filming, mastering and releasing Planet Earth II in 4K. The Ultra HD Blu-ray follows the TV broadcast, and DVD and Blu-ray release, of the series at the end of 2016. It conforms to the official UHD Premium specification, which is not only defined by 4K and HDR, but also support for 10-bit colour depth and BT.2020 colour space representation. The show is the BBC's first to be shot in Ultra HD and Hybrid Log-Gamma (HLG - BBC’s proprietary form of HDR), but the disc has been re-encoded to HDR 10 - the HDR format more typically associated with Ultra HD Blu-ray - by Sony, which already has over 20 Ultra HD Blu-ray titles available. While some Ultra HD Blu-rays offer object-based immersive sound, such as Dolby Atmos and DTS:X, Planet Earth II’s epic Hans Zimmer-scored track will be in 5.1 DTS-HD. As it turns out, following an animal chase across a desert with extra equipment and microphones wasn't practical. To watch Planet Earth II Ultra HD Blu-ray, you’ll need a 4K TV or 4K projector, a 4K Blu-ray player… and a spare £40 for the disc. It might be the most expensive Blu-ray you’ll buy all year, but it also comes with a standard Blu-ray copy, which includes the ‘Making Of’ clips and special features. Perhaps the best news is that we don't have long to wait; Planet Earth II 4K Ultra HD Blu-ray will be released on 13th March and is now available to pre-order from Amazon. In the meantime, we'll be posting a full review soon, so keep those eyes peeled.